Yes, it is as nerdy as it sounds. Star Wars Minute is a podcast that talks about every Star Wars movie, one minute at a time — including the opening crawl and the closing credits. They release one episode every weekday, and are currently partway into Revenge of the Sith (having gone through the original trilogy and other prequels), which means they’ve put out more than 600 episodes so far. In each episode, they somehow manage to talk for about 30 minutes about one minute of the film, and do so without being boring or repetitive. The format works well enough that it sparked a host of similarly-themed podcasts, all of which are listed at Movies By Minutes. There’s great chemistry between the regular hosts, Alex Robinson and Pete the Retailer, and each week they feature a guest. The conversation is usually light with lots of running jokes. 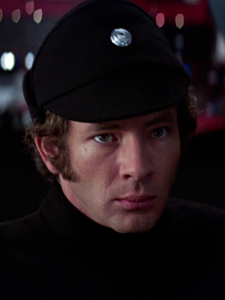 Of course, you can’t watch a film one minute at a time without getting quite deep into the geeky weeds (such as a long discussion about Pol Treidum’s dress sense), but most of the time the minute that they are supposedly talking about acts as a springboard for a broader conversation, nerdy or otherwise. For me this is the perfect podcast to fall asleep to: it’s funny but not intense enough to keep me awake, and the conversation is such that if I doze off for a few minutes I can easily catch up again. Plus, with the number of episodes they’ve done, you never need to worry about running out. The telescope dome. Modern domes tend to be smaller than more old-fashioned domes for a given telescope size. 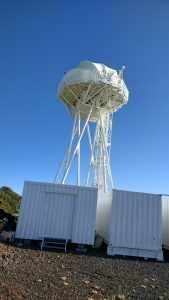 The telescope and the attached control building. A few weeks ago I was at the Thai National Telescope (TNT). The telescope is pretty newly built (around 2012 I think) so everything is a bit more modern than most telescopes. 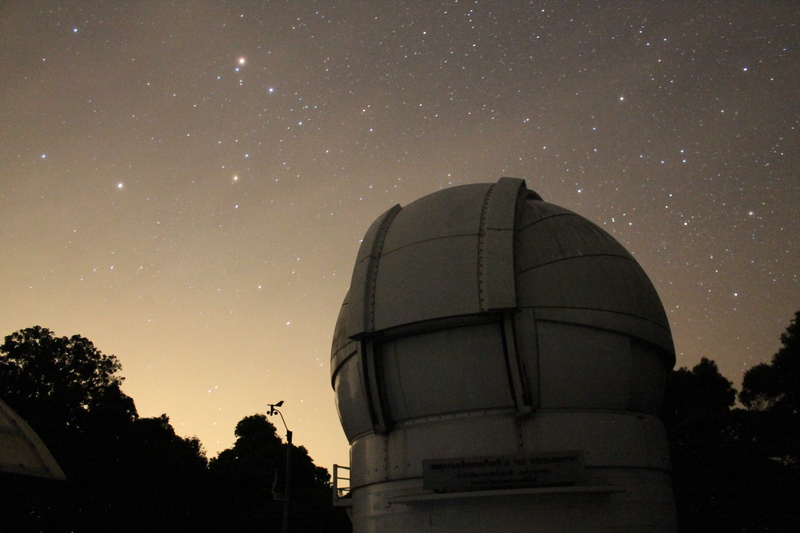 It’s a 2.5m telescope on top of Doi Inthanon, the tallest mountain in Thailand, about 2 hour’s drive from Chiang Mai. 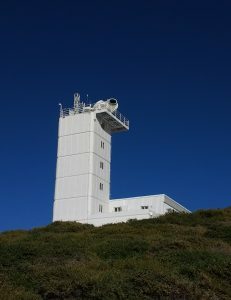 The telescope is run by a Thai government organisation called NARIT, who also run a handful of smaller (0.7m) telescopes around the world. 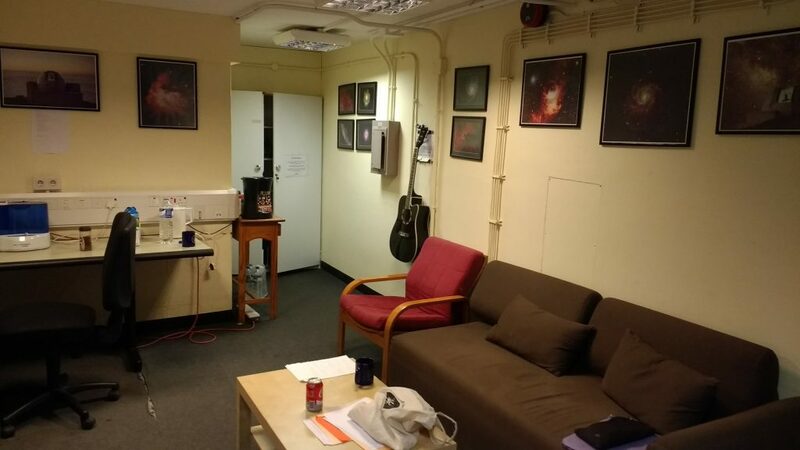 We control the telescope and instruments from a spacious control room in the building attached to the telescope. 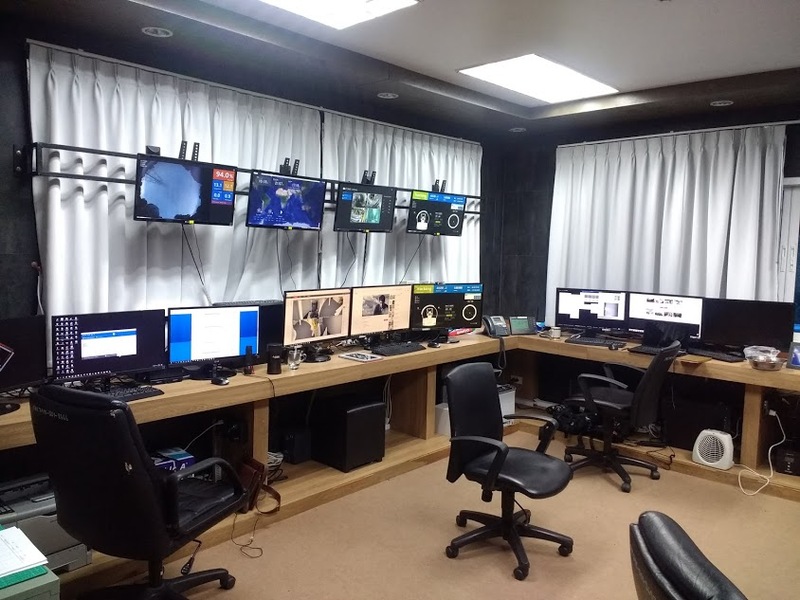 The monitors here are for controlling and monitoring the telescope itself (on the left) and one of the instruments (the three monitors on the right). There was generally 2-3 telescope operators around, plus me (I was controlling just the camera). Also in the building is a mini kitchen, a bathroom, and a sofa people can nap on. View from my window in the lodgeWe sleep in a lodge partway down the mountain. The lodge is in a holiday camp which is quite pretty, although it can be noisy when you’re trying to sleep during the day. 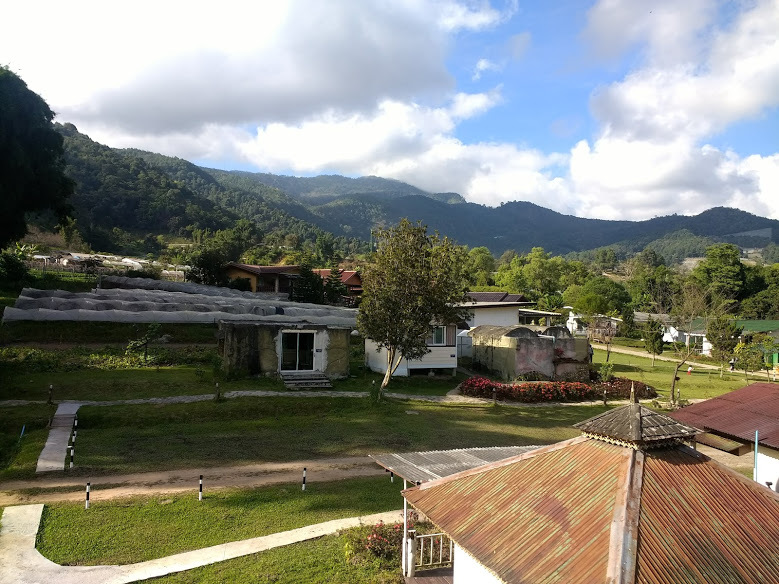 It’s about half an hour’s drive up the mountain every afternoon and the same back down in the morning — an unpleasant drive when it’s dark and foggy, especially with the number of tourists who drive up the mountain to watch the sunrise. There was some awful weather and we didn’t get too much data — we were closed for 5 nights out of the 6 I was there. The bad weather is apparently related to the El Nino / La Nina weather cycle, where South-East Asia gets heavier rain during La Nina years. I was here a year ago, and had much better luck with the weather then — and even managed to take some pictures of the sky when it was clear. I’ve been trying to write more recently, and trying out new types of writing. 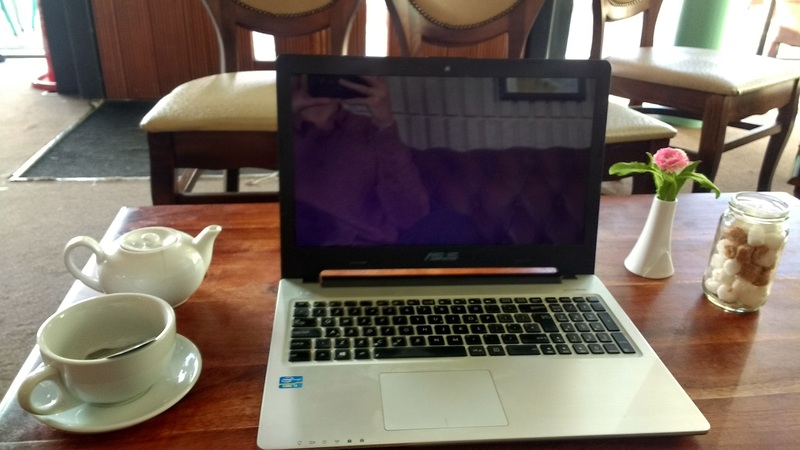 It can be hard to find time around work, but I managed to find some time in the evenings and weekends. I’ve even tried going out to cafes at weekends for a change of scenery. A couple of things have been published recently so I thought I’d do a roundup. Boring post for everyone except me then. I wrote a couple of articles for the science section of Warwick’s student newspaper, The Boar. One was on the space rock Oumuamua (or spaceship!!? ), and the other was on Warwick’s inclusion in Sloan. In the new year I’m planning to try to branch out into other sections (or at least science other than astronomy). I wrote a short story which was published in another student publication, The Dodo (they put it online as well as on paper, and it’s here on my website as well). I’ve always liked the Dodo, they publish short stories and poems and it comes wrapped up like a scroll and sealed in wax. And the regular Astrobites posts are still going, most recent one here. I thought it seemed kinda popular on Twitter this month — surprised me as it was a right pain to write. Oh and a one-tweet flash story of mine was retweeted by Here Comes Everyone, which totally counts as well. I’ve been rewatching Buffy the Vampire Slayer, nerd that I am. I’ve seen most episodes, but never stuck to it all the way through before. While I didn’t expect to hate it, I’ve been surprised just how much I’m enjoying the rewatch. It remains an incredibly well-written show. I went in expecting that some of the high school themes wouldn’t chime with me anymore, and to some extent that is true (after all I am a full decade older than the target audience). But, I do still find plenty of depth in the writing and themes. I find (surprisingly) that I kind of miss the semi-periodic structure of TV shows from that time compared to the long-form structure that most shows seem to have these days. Alongside rewatching it, I have been listening through the back-catalogue of the amazing podcast Dusted, hosted by Alastair Stephens and Lani Diane Rich of StoryWonk. The podcast ended some months ago (and I believe the hosts are now divorced from each other, which makes for an odd feeling sometimes), but they made it through to somewhere in Season 6 so I’ve got a good amount left to get through. Both hosts are writers and teach writing courses, and their conversations about story structure and characterisation are always fascinating. They seem pretty knowledgeable about directing and camerawork as well, something I know nothing about that gives some extra insight. Copying the Dusted style, I’ve been keeping a list of every Buffy episode in order of how good they are. This list is objective and inarguable. I don’t have much to say for this one, just a random collection of poor-quality phone pictures. Coming to the end of an observing trip (my first solo!). 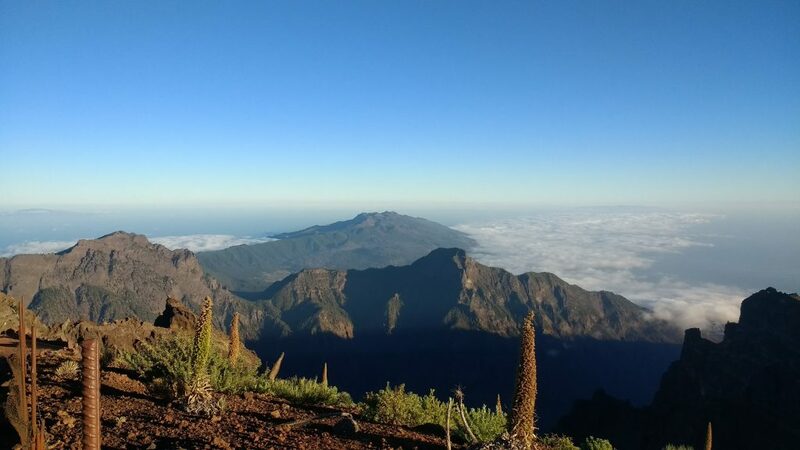 Six nights on La Palma — 2 on the INT and 3 on the WHT, with a night off in the middle. Pictures all from around the observatory. 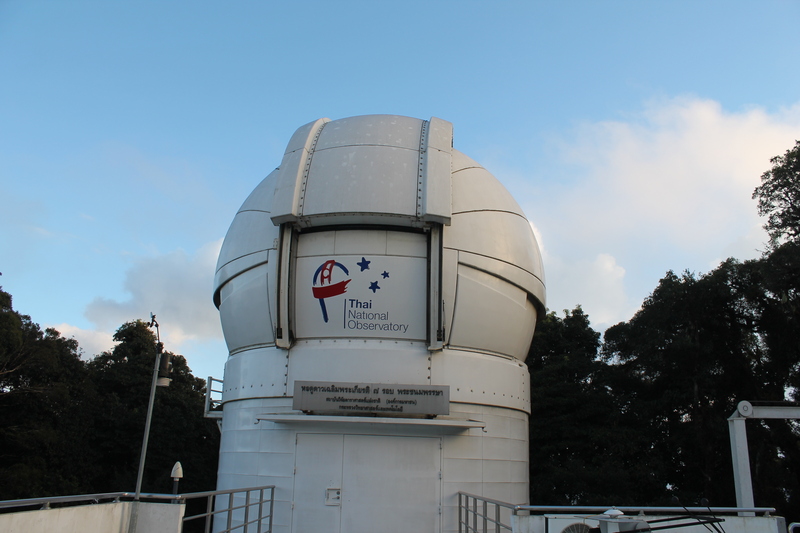 The William Herschel Telescope, where I’ve been observing for the past 3 nights. 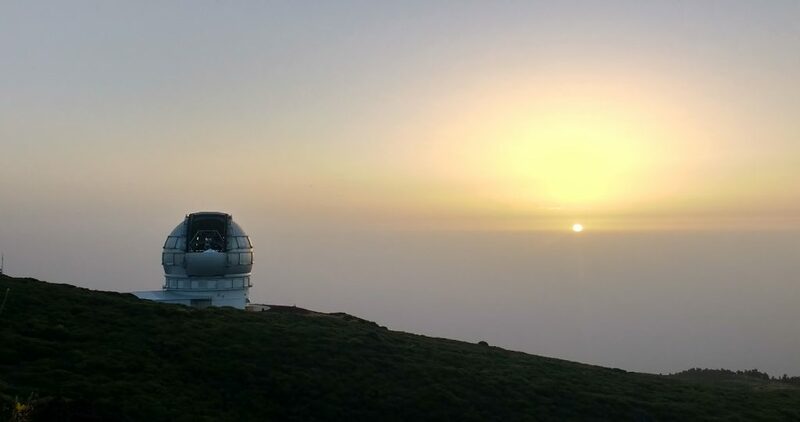 The National Galileo Telescope, opening ready for sunset. 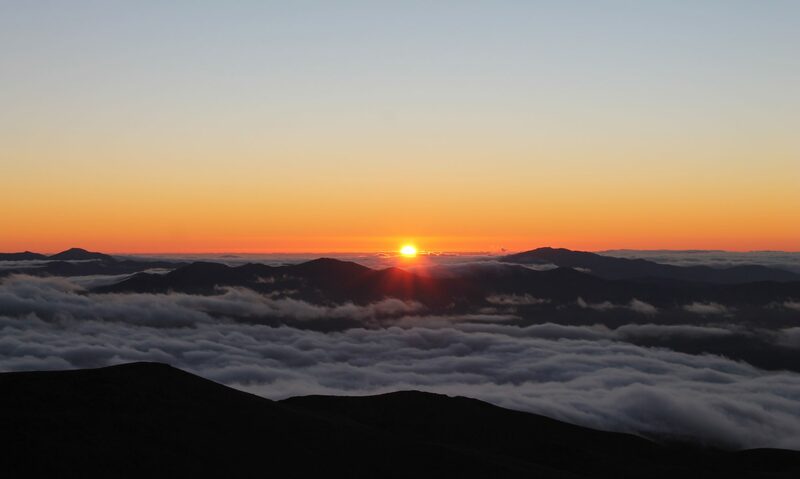 Telescopes always open before sunset to ventilate the dome, otherwise the temperature difference between inside and outside causes turbulence which reduces the quality of image they can take. Since I had some free time this afternoon before sunset, I drove up to the viewpoint at the top of the observatory, from which you can see into the caldera of the volcano, as well as pretty good views in every other direction. Looking down the length of the island. 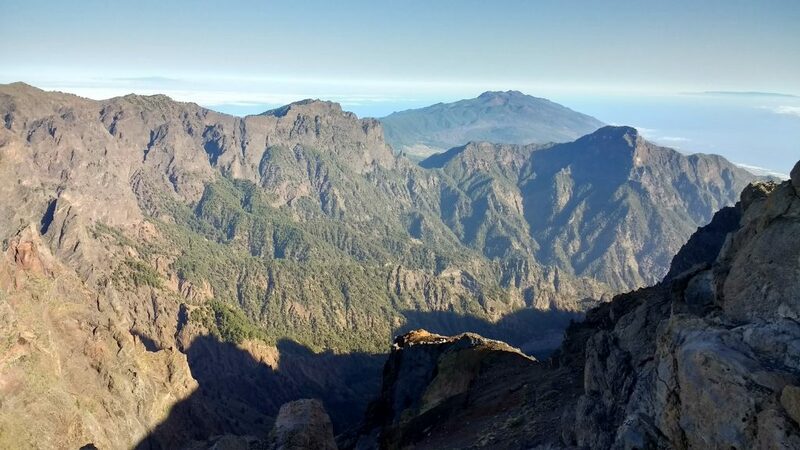 In the foreground is part of the caldera (the crater) of the volcano, behind is the mountain ridge and the sea. In the other direction, telescopes in a line: NOT, WHT, DOT, SST, INT and JKT. The other day I had a night off without a car. I decided to walk up to the GTC after dinner, which meant I happened to be there to watch it open at sunset. 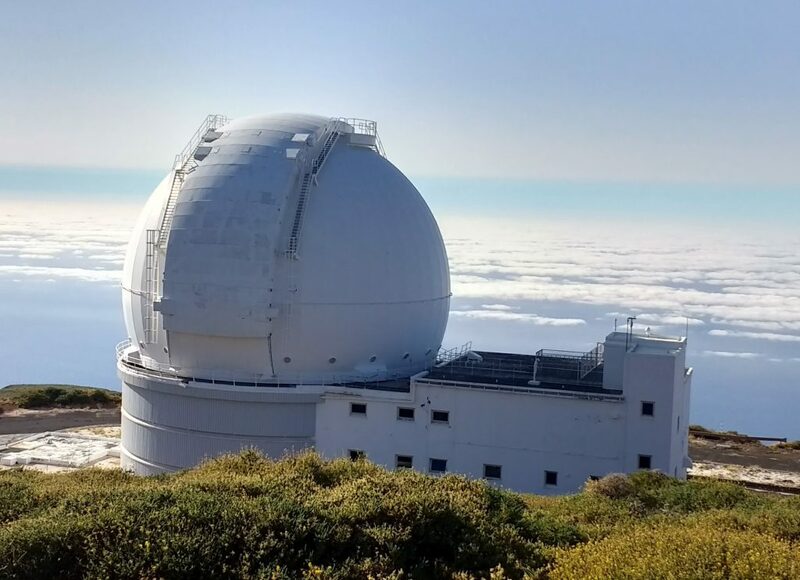 The GTC is the Grand Telescope of the Canaries, the biggest telescope in the world as measured by the diameter of its mirror (10.4m). It was quite dusty that day (the Canary Islands are downwind of the Sahara so often experience these dust clouds). Unfortunately my phone didn’t handle the contrast very well so the pictures weren’t great. It was cool to watch though. Sun setting behind the GTC. 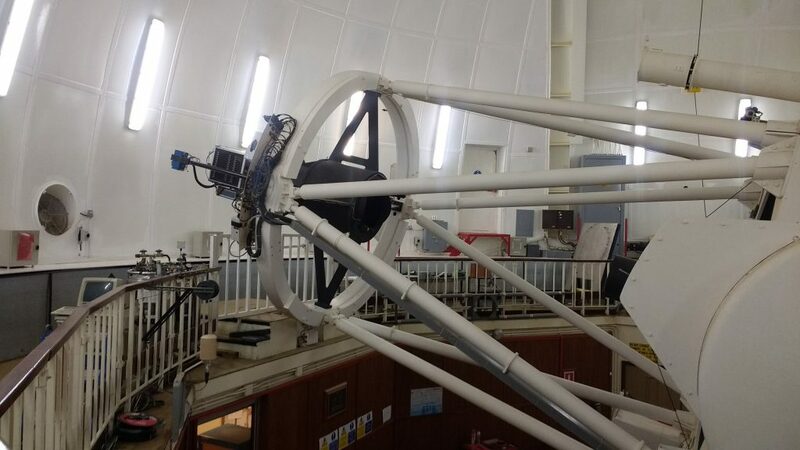 The Isaac Newton Telescope is my new favourite telescope. Most telescopes the observer isn’t allowed to touch the controls for the telescope itself; we just control the instrument. At the INT you observe alone, meaning you control both. Driving the telescope is easier than I expected. For the most part it’s done from the command line — just type ‘gocat’ and the name of your star and the telescope moves itself to point to it. There are times though that you have to switch the telescope over to ‘engineering mode’, at which point you drive it with the big bank of switches on the right. There’s a window through which you can see into the telescope dome, and a microphone so you can hear the various parts moving. 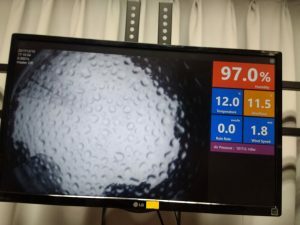 You also use the same buttons to open the dome up at the start of the night. At the end of the night you have to bring the telescope into ‘access park’, ie move it so that the end of the telescope is reachable from the balcony. 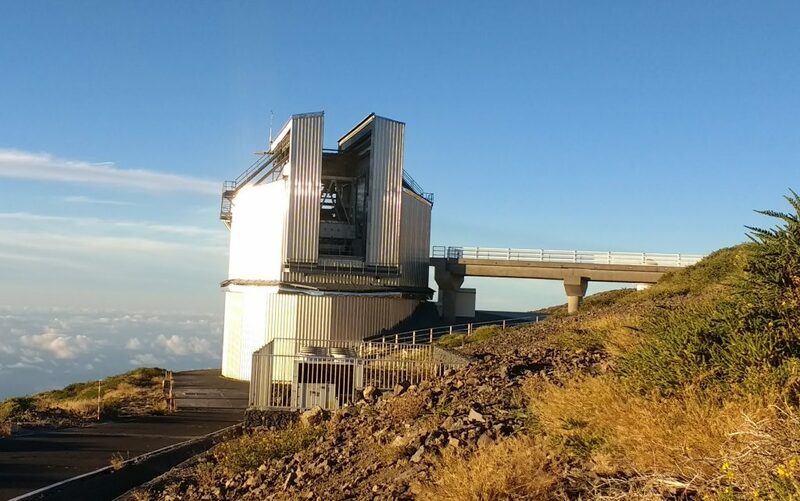 This is the most intimidating part of the experience, as you have to override some of the safety checks to bring it so low, meaning that a couple of alarms will start going off — you then watch the telescope moving towards the balcony pretty fast, while you manually silence the alarms. Once it’s parked you have to go up and refill the camera’s liquid nitrogen supply, to keep it cooled to -160 degrees. It only takes around 5 minutes, but when you’ve been working all night and want to go to bed that feels like a long time. NITES and the W1m. The grey sky is the ‘Calima’ – dust blown in from the Sahara. 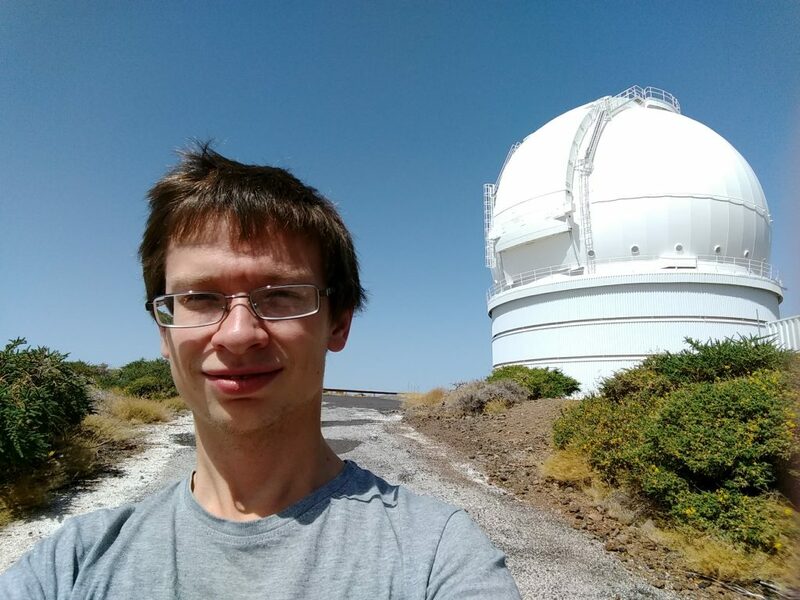 I’m currently at La Palma, an observatory in the Canary Islands, to take data for someone in my department. Despite being comparatively close, I haven’t been here very often. It’s only the second time I’ve been here, and the first for over a year. While it’s not my favourite observatory, I enjoy seeing so many famous telescopes in one place — all the telescopes I’ve heard the most talk about are here, within a 5 minute drive of each other. 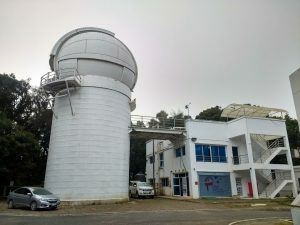 Among these is the “Warwick Observatory” — a cluster of telescopes that my own University of Warwick is heavily involved in, in some cases leading. Among them is the Warwick 1m (unfortunately they decided not to go with the Warwick One-Metre-Big Automated Telescope, or WOMBAT). Beside it is NITES the 40cm telescope. In the other is WASP-North, which along with WASP-South has found well over 100 exoplanets. Tucked away behind WASP is MASCARA, an ingenious Leiden-led project which effectively consists of 5 digital cameras pointed at the sky. I wrote an article about MASCARA recently, here. 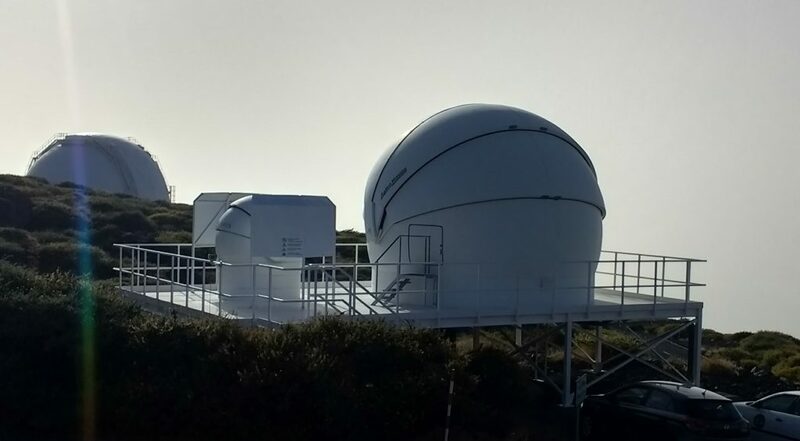 It was particularly cool to get to see GOTO, the brand-new telescope array from the Warwick/Sheffield/Monash collaboration. The PI of the project is Danny Steeghs, one of my supervisors. 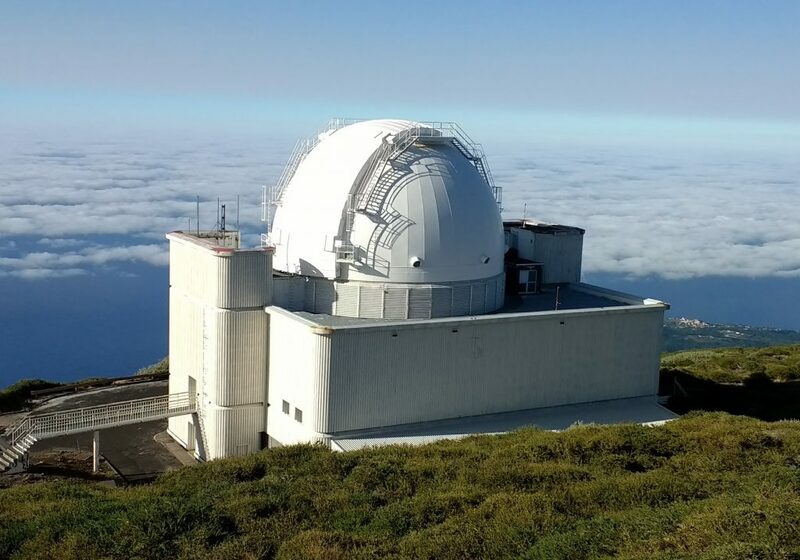 The telescope was only assembled in its dome within the past month or two, so not too many people have seen it yet, and the official inauguration ceremony was just a few weeks ago. 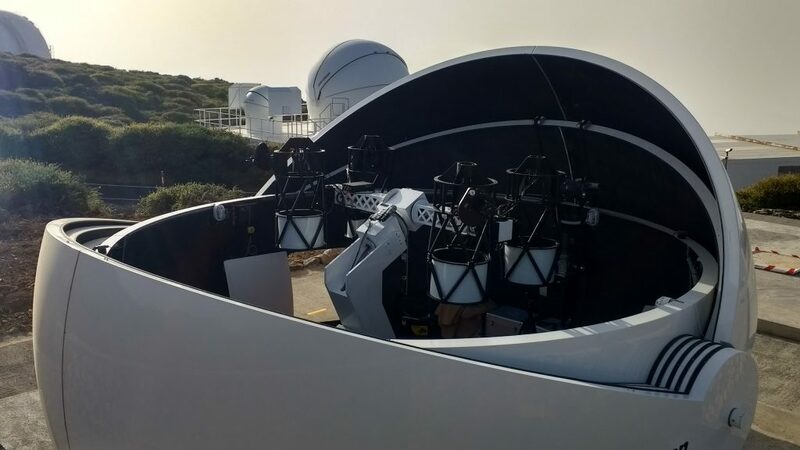 It’s still in its early stages — eventually there will be 8 telescopes mounted on the frame rather than 4, and another dome with the same setup next door. GOTO is designed to follow-up on gravitational wave events by looking for visible light coming from the same source. Whenever a gravitational wave event is detected — so far four have been — GOTO will pivot to that patch of sky and scan for new light sources. Its parallel telescopes give it a wider field of view, necessary because it needs to cover a large area of sky as quickly as possible. 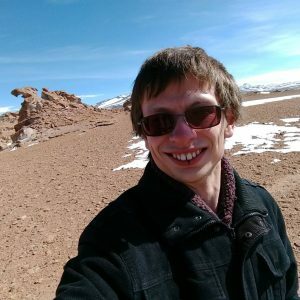 I’m a twenty-something living in Coventry and studying for an Astronomy PhD, while reading and writing as much as I can in my spare time.